Former St. Albert resident A.J. Bruyere returns to O’Maille’s Irish Pub as a Entertainer/deejay to spin a few Tunes and yarns on New Year’s Eve. 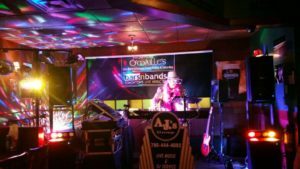 As founder of A.J.’S Group, Bruyere has performed across Alberta & numerous local venues since 1981 and incorporated a deejay format in ‘2000’. “It pleases my clientele to be well-rounded,” says Bruyere. He provides a mix of Top 40 dance music from Black Eyed Peas to LMFAO to Keith Urban using electric keyboard, guitar and an MP3 laptop. Bruyere credits his uncle Danny Boisvert, owner of St. Albert’s former Danny Boisvert and Sons Auto Repair, with influencing his career choice. So get ready to kick up your heels with A.J.’S Live and MP3 dance beats. A.J.’s Live Music and DJ Mix Now on Facebook! Check out A.J.s Live Music and DJ Mix also on YouTube! Previous PostEdmonton Prospects Baseball Club – JulyNext PostKaraoke Jam!